Finding the proper skin care products for your specific skin can be tricky, but a lot of the times the eye area is over looked. The skin around the eyes is very delicate, so normal skin care products that are used on the rest of the face shouldn't be used on the eye area. Skin Ceuticals has some amazing eye care products that will help keep the under eye skin healthy and help to reduce puffiness and signs of aging. 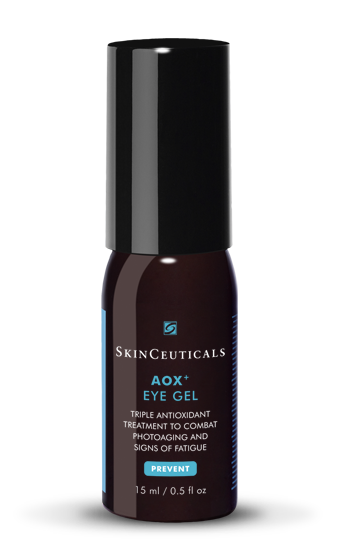 AOX+® Eye Gel has the same Vitamin C technology as the rest of the Skin Ceuticals vitamin C line, but safe to use around the eye area. It contains an antioxidant combination to help protect the delicate eye area from environmental stress all while reviving under-eye skin and reducing puffiness. AOX+® Eye Gel prevents signs of aging while correcting existing photodamage. It also increases under eye circulation which reduces swelling. Using this product in conjunction with Skin Ceuticals Eye Balm,or A.G.E Eye Complex, will ensure you see the best results possible for your eye area. With this product featured as our product of the week, we will be offering it for 15% off through Friday January 18. If you decide to purchase it with the Eye Balm or A.G.E. Eye complex we are offering 20% off of both! Licensed Esthetician, Keri Eichhorn, a Summit Plastic Surgery & MedSpa, can help you, determine which products will best benefit your skin. Contact Keri to schedule your complimentary skin care evaluation and consultation today!